Google has announced the Android L at Google I/O, a new unified design language alongside a host of new features for the platform. The underlining message from Google is they want Android everywhere, in the car, on a watch, even on the TV, all with one unified experience. The unified experience is brought together by Material Design, a new design language for developers to adopt. This language has a bit of skeuomorphism alongside engaging and vivid animations, allowing the user to differentiation content and move from activities in one animation. Google has beefed up the back end of Android L, adopting the ARM runtime alongside other new runtime features, making Android devices less hungry for battery and more powerful, even with the same hardware specifications. Notifications have been updated, offering new contextual information based on geolocation. Google also sorts notifications by geolocation and importance. Recents have been updated to include Web searches and Google Docs, with a new UI similar to Safari on iOS7. Google’s lock-screen can now be bypassed if the user is wearing or close to a Bluetooth connected device. Google Fit has been announced for developers and users, allowing Android L users the ability to check hundreds of different fitness and health stats. Android L might not have the most features, but it is an effort for Google to show the future to developers. Material Design will work on all Google approved platforms and new seamless integration makes moving from one device to another simple. The Android L Developer Preview will provide developers with 32-bit system images to flash on the Nexus devices, with an additional emulator for 64-bit system images. 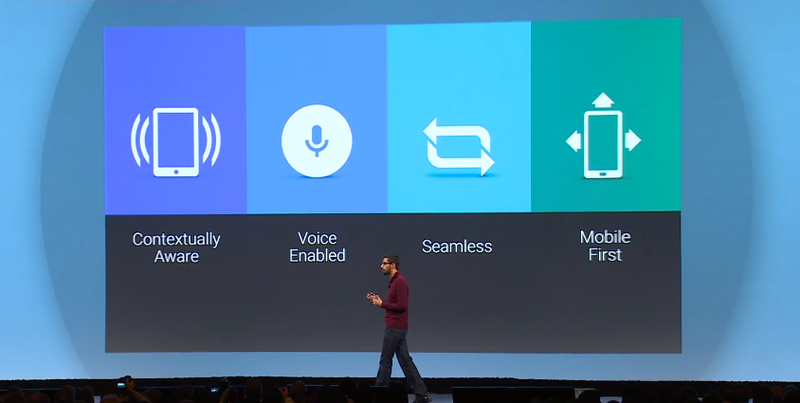 Google I/O previewed Android TV, Auto and Wear. We also got updates on Chromebooks, Chromecast and other devices, but no word on Google Glass on anything Nexus. Google did announce two new Android Wear devices will be available today, the LG G Watch and Samsung Gear Live.